Renato Soeiro: Escrevo-te em cima do capô de um carro da polícia derrubado. / I am writing to you on a motor hood of a knocked-over police car. Escrevo-te em cima do capô de um carro da polícia derrubado. / I am writing to you on a motor hood of a knocked-over police car. My trade union is part of a platform together with professional associations and neighborhood organizations. This platform protests the construction work in Taksim that will demolish the park there. Therefore, I was following the related campaigns on Taksim Square. When I heard that bulldozers came and the trees in the park were cut, I ran to the park. Instead of shutting down the illegal construction – the court revoked the construction project- the police, used tear gas against people who want to save the trees. First night, we took my tents and sleeping bags and went to the park. We sang and chatted till dawn. In the evening, thousands of people were gathered. The concert was continuing on the stage. We were discussing urban regeneration, environmental destruction, human rights and workers rights. The highlight of all these discussions was that they are all the result of government policies. An ever-changing and growing committee was established. When I woke up in the morning the camp was drowned into tear gas and everyone was running around. The police set the tents on fire. They uprooted the saplings that were planted a day before. The bulldozers were working under the protection of riot police. We did not want to get revenge from police. Someone was reading a novel to the police with the help of a megaphone that was saved from the fire. Another one was asking “why did you set my guitar on fire?” but by singing. When we succeeded in entering the park we set up bigger tents. In the evening there were tens of thousands people in the Square. Renowned musicians cancelled their concerts and came to the park. The following night we were better prepared. The garbage was taken periodically. Volunteer security staff was visiting patrol. Women were able to walk comfortably in the camp area. Government’s new alcohol regulations converted drinking to a political action. People were chanting slogans, on the other hand they were singing songs, and drinking. Towards the morning hundreds of goggles, gas masks, lemon, vinegar, home-made anti-tear gas solutions prepared by stomach pills were distributed. 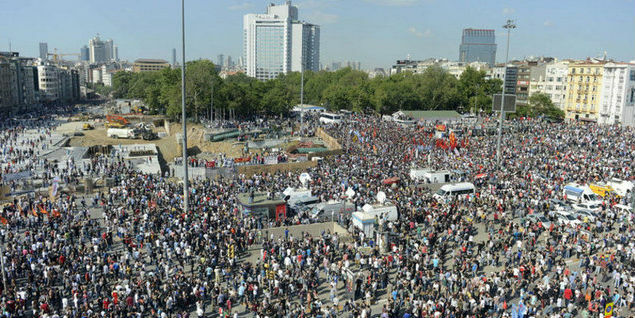 There were thousands of people in the park when the police attacked at 5 o’clock in the morning. There were no warnings and suddenly we were unable to see anything. We evacuated the park inline with the plan we made earlier. Clashes in the street continued till morning. I managed to sneak in the park quietly getting advantage of the fatigue of the police. I watched the Bosphorus sipping my tea in the shadow of a tree. I hope it won’t be the last time I see this view. The protestors tried to enter the park by gathering in back streets again and again. The police prevented them by using excessive use of force. The whole city turned into a rally arena. Some demonstrators walked the bridge that connects Asia and Europe. So, who are these people that gathered in the square? It won’t be true to say that these people have common views and common aims. The only common thing was they were angry to the government… The police violence against the youth who wanted to protect the trees triggered people and all the people who are against the government were out on the streets. People, who soaked refuge in a barricade, were tweeting, people uploading photos to Instagram with a police helmet. Pupils were drawing nasty graffitis addressing to the Prime Minister. People drinking beer for a little rest… I met a couple who were making plans for their wedding in the telephone booth where I sheltered during a rubber bullet rain. In the past five days, growing number of demonstrators are having fun and demonstrating at the same time without sleeping or resting. The most chanted slogan is “Resign Government!” Police violence is not driving them away. Fear is defeated now. We learned to raise our voice when we are angry. Some people are fighting, some are dancing. Some are attacking around in insobriety; some are collecting the garbage and treating the street animals. I do not know what is going to happen tomorrow! But today is a new day and we are all new people. What am I doing now? While ten thousand of demonstrators are asking PM to resign with several different reasons, I am writing to you on a motor hood of a knocked-over police car.